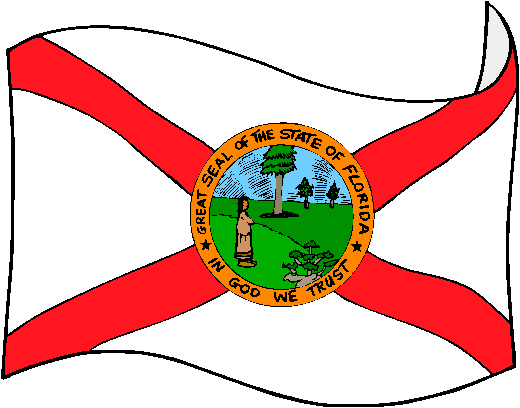 The flag of Florida is a red saltire (diagonal cross) on white background with the state seal superimposed in the center. From 1868 to 1900, the flag was simply the Florida seal on a white background. However, this could appear to be a white flag of true when hanging still, so Governor Francis P. Fleming proposed the addition of the red cross. The modified design was adopted by the state, after being approved in a popular referendum. Annin Flagmakers Model 140960 Florida State Flag 3x5 ft. Nylon SolarGuard Nyl-Glo 100% Made in USA to Official State Design Specifications. Florida created a new state seal after it seceded from the Union in 1861, and made final modifications to the seal in 1970. Florida Governor Francis P. Fleming, who thought that the predominately white Flag looked too much like the traditional Flag of surrender, added the red cross of St. Andrew to the white Flag with the state seal in the middle. According to Florida law, the most current state seal must always grace the state Flag, and must be one-half the hoist and occupy the center of a white ground All Annin Flagmakers flags are sewn in either South Boston, VA or Coshocton, OH. Annin's superior quality is time-tested and meets the requirements of the most discerning buyer.